Instructions: Click here to view a larger photo of this project. Make the "H" pennant: Die cut 2 of the largest arrows from the sweet peony paper collection and glue them back to back. Curl the top of the arrow over to the back and secure with dries clear glue leaving a gap to thread ribbon through. Cut 2 x "H" using SVG file and layer these centrally onto the banner. Stamp 1 large peony bud and 3 small peony buds onto white card by inking the leaves with old olive and the buds with berry burst, use a water brush to spread the ink and colour the images. Diecut. 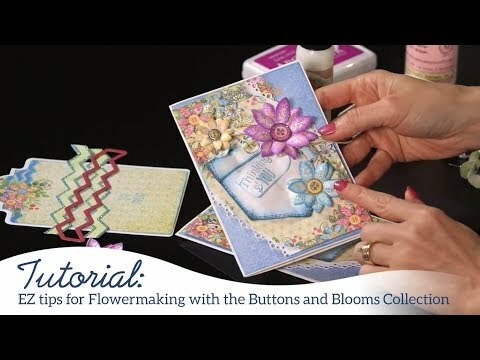 Add a little more ink to shade the blossoms and shape using the flower shaping tools. Adhere to the banner using hot glue. Using some scrap from the paper collection, die cut 2 x 2nd smallest arrows, glue together and curl forward, secure with dries clear glue. Make the "E" pennant: Die cut 2 of the largest arrows from the Backyard Blossoms paper collection and glue them back to back. Curl the top of the arrow over to the back and secure with dries clear glue leaving a gap to thread ribbon through. Cut 2 x "E" using SVG file, using paper from the collection and adhere these centrally onto the banner. Stamp the coneflower onto white card by inking the leaves with old olive and the flowers with mango melody (stamp 2 additional heads for the large coneflower), use a water brush to spread the ink and colour the images. Diecut. Add a little more ink to shade the flowers and leaves and shape using the flower shaping tools. Layer the 2 additional heads of the larger flowers on top of the complete coneflower and glue the head of the flower, cover with black gala glitz. Add gala glitz to the smaller flowers in the same way and use hot glue/wet glue to position the flowers onto the banner. Using some scrap from the paper collection, die cut 2 x 2nd smallest arrows, glue together and curl forward, secure with dries clear glue. Make the "A" pennant: Die cut 2 of the largest arrows from the Sweet as Honey Paper Collection and glue them back to back. Curl the top of the arrow over to the back and secure with dries clear glue leaving a gap to thread ribbon through. Cut 2 x "A" using SVG file using contrasting paper from the collection and adhere these centrally to the banner. Stamp the bees in black memento ink, cover in black embossing powder, remove excess and heat to set. Colour using mango melody ink. Die cut and add transparent glitter to the wings. Shape using flower shaping tools and adhere to the banner using hot glue. Using some scrap from the paper collection, die cut 2 x 2nd smallest arrows, glue together and curl forward, secure with dries clear glue. Make the "R" pennant: Die cut 2 of the largest arrows from the Oakberry Lane Paper Collection and glue them back to back. Curl the top of the arrow over to the back and secure with dries clear glue leaving a gap to thread ribbon through. Cut 2 x "R" using SVG file, using contrasting paper from the collection and adhere these centrally to the banner. Die cut 2 of the see-sawing squirrels from the pad and a 3rd from white card layer these together using dries clear glue. Shape using the flower shaping tool and add to the banner with hot glue. Stamp the small and medium blossoms onto white card using Deep purple archival ink and die cut. Colour the edges of the blossoms with the ink and place in the mold face down. Run through the diecutting machine to shape and layer the smaller flower inside the larger dries clear glue, add stamens to the centre. Stamp, die cut and mold the leaves in the same way but using the paper from the pad and old olive ink. Add to the banner using hot glue. Using some scrap from the paper collection, die cut 2 x 2nd smallest arrows, glue together and curl forward, secure with dries clear glue. Make the "T" pennant: Die cut 2 of the largest arrows from the Buttons and Blooms Paper Collection and glue them back to back. Curl the top of the arrow over to the back and secure with dries clear glue leaving a gap to thread ribbon through. Cut 2 x "T" using SVG file, using contrasting paper from the collection and a 3rd with white card, adhere these centrally to the banner. 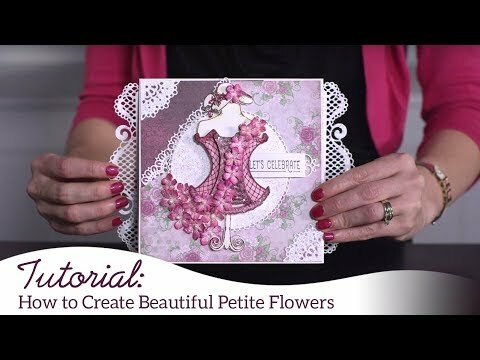 Stamp the smallest blooms onto white card using berry burst ink and die cut. Colour using magenta hue archival ink on daubers and shape with the flower shaping tools. Stamp the leaves onto old olive card using old olive ink and diecut. Shape using the mold. Add dries clear glue to the top of the leaves and sprinkle with transparent glitter. Stamp the buttons onto paper from the pad using black ink, cover with 3D crystal lacquer and allow to dry. Position all the elements and hot glue into place.Using some scrap from the paper collection, die cut 2 x 2nd smallest arrows, glue together and curl forward, secure with dries clear glue. Make the "F" pennant: Die cut 2 of the largest arrows from the Patchwork Daisy Paper Collection and glue them back to back. Curl the top of the arrow over to the back and secure with dries clear glue leaving a gap to thread ribbon through. Cut 2 x "F" using SVG file, using contrasting paper from the collection, adhere these centrally to the banner. Stamp one each of the swirling daisies onto white card using black memento ink. Colour using granny apply green and magenta hue ink then die cut. Shape using the flower shaping tool and position onto the banner using hot glue. Add silver moondust glitter drops into the centre of each flower. Using some scrap from the paper collection, die cut 2 x 2nd smallest arrows, glue together and curl forward, secure with dries clear glue. Make the "E" pennant: Die cut 2 of the largest arrows from the Floral Fashionista Paper Collection and glue them back to back. Curl the top of the arrow over to the back and secure with dries clear glue leaving a gap to thread ribbon through. Cut 2 x "E" using SVG file, using contrasting paper from the collection, adhere these centrally to the banner. Stamp the corset using Rich Razzleberry ink and colour using Copics. Shape the corset using the flower shaping tools and add transparent glitter. Adhere to the banner using hot glue. Using some scrap from the paper collection, die cut 2 x 2nd smallest arrows, glue together and curl forward, secure with dries clear glue. Make the "L" pennant: Die cut 2 of the largest arrows from the Tulip Time Paper Collection and glue them back to back. Curl the top of the arrow over to the back and secure with dries clear glue leaving a gap to thread ribbon through. Cut 2 x "L" using SVG file, using contrasting paper from the collection, adhere these centrally to the banner. Stamp the leaves in old olive ink onto white card and water colour. Die cut and brush ink onto the edges of the leaves, shape using the flower shaping tools. Stamp the tulips and filler flowers in black memento ink onto paper from the paper collection and colour the stems with Olive ink. Brush magenta hue ink at the base of the tulips to shade, die cut and shape all the leaves and flowers. Hot glue into position and use wet glue to add transparent glitter to the flowers. Using some scrap from the paper collection, die cut 2 x 2nd smallest arrows, glue together and curl forward, secure with dries clear glue. Make the "T" pennant: Die cut 2 of the largest arrows from the Burst of Spring Paper Collection and glue them back to back. Curl the top of the arrow over to the back and secure with dries clear glue leaving a gap to thread ribbon through. Cut 2 x "T" using SVG file, using contrasting paper from the collection, adhere these centrally to the banner. Stamp the spray onto white card using gorgeous grape ink and heat emboss with clear embossing powder. Colour the spray using Kuretake pens and a water brush. Shape using the flower shaping tools and adhere to the banner using hot glue. Using some scrap from the paper collection, die cut 2 x 2nd smallest arrows, glue together and curl forward, secure with dries clear glue. 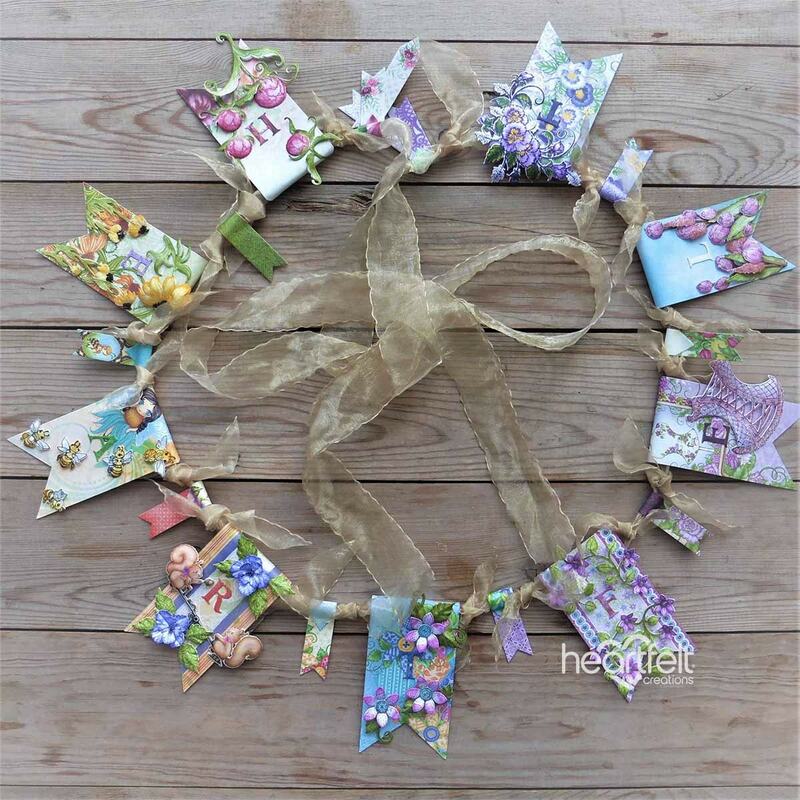 Thread the banners and the mini banners onto a 1.5" organza ribbon and knot a little ribbon between each banner to position them and prevent movement. Leave some ribbon at the end for hanging the banner.